“Do you need a large amount of money? Legal counsel?” This is one of my favourite movie quotes of all time and one that I hope I never have to use on my own kids. If you don’t already recognise it, it’s from Juno. Apart from laughing all the way through the film, I also sang – the soundtrack to Juno is movie music perfection and one that I never get tired of listening to. Needless to say, when I discovered that Barry Louis Polisar, the musician behind Juno’s title track All I Want is You, is a big name in children’s music, I was all ears. Polisar has been entertaining kids since the seventies with his own style of guitar-heavy-folk-music-meets-humorous-poetry. A hit on Sesame Street and ongoing tours through US schools in the seventies and eighties cemented Polisar’s songs in the minds and hearts of many little kids. So much so that a group of fans, now musicians themselves, banded together to create a sixty-song tribute album, We’re Not Kidding! A Tribute to Barry Louis Polisar. Before getting into the nitty-gritty of the album, I’ll declare myself a fan of tribute albums. I like to hear different interpretations of my favourite songs and along with the Juno soundtrack, If I Were a Carpenter is one of my most often played albums (there’s another Juno reference in there for true fans!). Even if you are not familiar with Polisar’s original recordings, there is lots to love about the tribute tracks. Start out with the sweet and bouncy version of All I Want is You, recorded by The Vespers and then slide into DeLeon’s mellow recording of My Brother Thinks He’s a Banana. None of Polisar’s trademark humour is lost and with sixty tracks on the album it is hard to pick only a few standouts. The titles speak for themselves – My Brother Threw Up on My Stuffed Toy Bunny, Never Cook Your Sister in a Frying Pan, Shut Up in the Library and He Eats Asparagus, Why Can’t You be That Way? That said, keep an ear out for The Radio Active Chicken Heads thrashy take on Underwear, Nate Lieby’s frenetic rendition of I Never Did Like You Anyhow and Elizabeth Street’s gentle version of That’s What Makes the World Go Round. My favourites also include Me and You by Your Little Pony and I Need You Like a Donut Needs a Hole by David. W. Jacobsen and September’s Shadow. For the best use of the word ‘tibia’ in a song, you can’t go past Loverlee’s I Love Your Eyes. We’re Not Kidding! 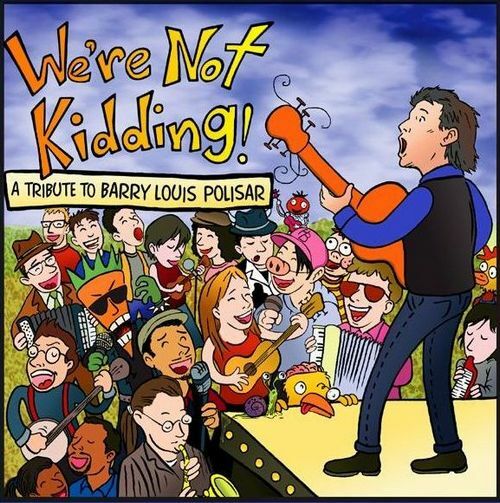 A Tribute to Barry Louis Polisar is available on iTunes – at $16.99, it’s great value children’s listening with lots of varied sounds.